LifeProof integrated BrightSign’s digital signage players into point-of-purchase (POP) displays in 800 of Best Buy’s US retail locations. 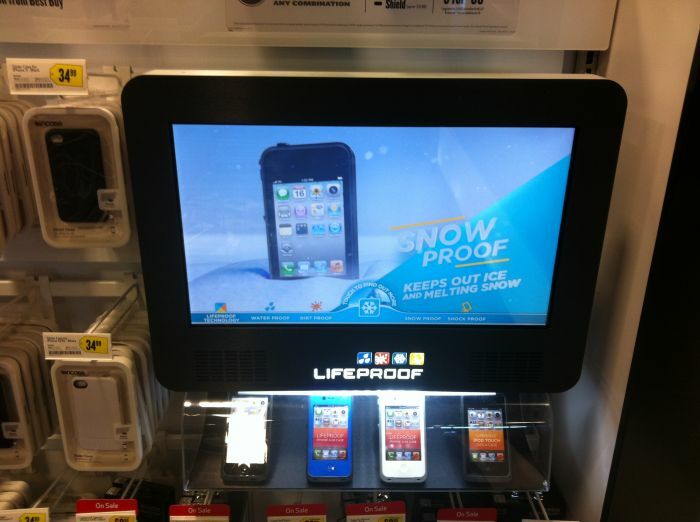 A leading manufacturer of rugged cases for iPhone and iPad, LifeProof is using a total of 1,600 inline displays to engage customers and generate sales in the increasingly competitive iOS accessories market. POP displays are only successful if they entice customers to engage with the displays in a meaningful way. BrightSign’s abundant content support and robust interactive capabilities gave LifeProof the tools to present content in a way that is both informative and entertaining. The displays deliver rich content with interactivity that lets the customer tailor the experience to their specific areas of interest. This personalized experience enriches the shopping experience and greatly improves the likelihood of a sale. The presentation, built using BrightAuthor, allows for video time-code events to send a command to indicate what video should be started when the same interactive touch point is activated on the touch screen. BrightAuthor audio zones listen for different zone messages to trigger “attract state”, “snow state”, “dirt state”, etc.